Upon the completion of each collaborative, poetic object project, a complete transcription of the poet and printer's conversations will be posted. 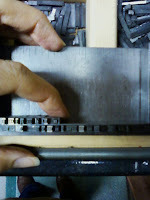 Come read about what a printer and a poet consider when they design a broadside, a broadbook, or a chapbook together! I am currently seeking submissions for Zumbar Press. I've got the site up now but am still configuring it to my liking. That being said, the word Zumbar is Spanish and is taken from a Cecilia Vicuña poem. Please consider this invitation and send me work that you'd like to see and have as a printed poetry object. I want to send something short for a broadside, but am concerned that I do not have anything specific to Zumbar's aesthetic swoosh that is sound-related explicitly. There is one particular item that you might have heard during the Dusie advent calendar fest -- it is a translation of Catullus's Poem 99. Let me send you a draft of the piece and a short essay that I wrote in relation to it. You will find that the piece itself (the last page) is visually engaging and works explicitly with parsing sound into the impossible to master pieces. But/And it also poses some challenges to the printer -- challenges that you may or may not want to explore at the moment. I will also attach the sound performance of the piece so that you can hear and see how the essay, the sound piece, and the potential broadside could interact together. The visual score has never been seen by anyone nor published. Perhaps you will be interested in the essay as well -- in fact, in a very small format, it would make a whole chapbook. If you think this is something Zumbar would like to work with, I can give you a clean, polished draft. A few words to let you know that I love your piece that you sent and intend to publish it. I have much to say on your piece thus far and questions for you, too. More coming. Hold tight to the absence of signposts in the sea. What are your feelings on using type faces other than Bodoni? If you would like to use the Bodoni 12 pt. then we’ll simply move forward with that choice for the broadside. Since this is a craft that can take all the time it desires and one that requires a printer to learn patience, I am happy to wait for your replies about some of my queries around the planning process with regard to the type face, the ink colors, the paper stock, and also the print run. The Bodoni is quite beautiful, and I'd actually love to print your work using that type face for a variety of reasons, but one of them is that I'm curious about the ways your broadside will compare with the one I printed for rawlings, which was all assonance and also had its body printed entirely in Bodoni. Also, let me know if there is any paper color or stock that you are currently envisioning for the broadside. Just so you know, I still have a stack of the same beautiful, off-white stock that I used to print rawlings’s broadside that I could also use for yours, too. But what I'm primarily interested in learning more about from you are the ink color(s) you’d like to use for the text. Are you open to me making suggestions, depending on how I am finding myself interacting with the text of your translations as both a poet and a printer? If so then I am very much interested in using a gradation of colors for your broadside as well. One other thing I’d like to ask you about is how you feel about my desire to print the two translations side by side, horizontally on the page, rather than opting to do a standard vertical printing. My reasons for wanting to do this are noted in the PDF of your work that I sent back to you. 1. Font: Bodoni is gorgeous, certainly. I particularly like the conversation it will create with the type face decision that you made for rawlings’s piece. 2. Coloration. I am very interested in using intense pigments. I propose deviating from the off white and working with high-contrast pigment/paper relation. Have you considered white ink on charcoal? My understanding is that light inks are harder to work with and more prone to showing error. So, given that, if you're reluctant, that would make a lot of sense. I mention the high contrast appeal to emphasize the appearance of "punched out" or erased lettering that could reflect the process. My concern is that without a supplementary note, and without the erasure/imprint process registered on the broadside, we would essentially have a block of consonants and vowels. 3. This brings me to the question of the dark color block that’s around the set of vowels. This was deliberate in the version you saw of the Catullus translation, but I don't see how single-letter arrangement type face letter setting can mime this. Seems more suitable for block printing? Are there other ways to present these two blocks of syllables as differing in quality and density? Would variation in font coloration do the trick sufficiently? One possibility is doing cutting work around the text blocks, but this gets labor intensive. 4. Layout and page size. Let’s go with your proposed "side by side" approach; I love this visual simpatico -- near/but/far/not/touching. Concomitantly, I also see the page itself as very long, rather than 8x11. How about halving that to a 4 or 5x11? Further, how about a double-sided printing? I imagine the front as being just the blocks of syllables, and the back containing my name, Zumbar details, title, etc. This would be very clean and maintain a serious commitment to the visual preference of the front without diluting the visual space with information like my name, the title etc...These are just ideas, of course. The calls are yours and I trust fully the decisions you make. Excited to see what evolves. I've been pondering your imaginings for the broadside. So, we'll go with the Bodoni and we'll go with printing side by side. The type face will most likely need to be 12 pt, but I can scrounge around the shop for 10pt. Yes, many of the things you noted for bringing out or highlighting the contrast would be best met (or more easily met using woodblocks); however, I think our eventual choices in paper stock and/or color of paper and ink will create the illusion of this contrast. I'm even curious about searching for paper and how that will reflect a gradation of color that might move from left to right horizontally. I envision this horizontal color gradation as a move from a midnight black mixed with a scarlet undertone, pulling out to a charcoal gray with a hint of dusty rose as undertone, to gray with a faint trace of pinkness as undertone, to finish or taper off as a grayish-white color. I will have to look into where I can go to find such gradations in coloration in the paper itself, but I really like that idea. I'm interested in your idea of going smaller with the page size, making it more compressed and leaving less "white space" to be compromised or violated. Yes, let's do that. Let’s also go with double-sided printing, reserving the inclusion of the details for the back of the paper. Aside from wanting your thoughts on the gradation of paper coloration, your initial thoughts on ink coloration, and your OK on the type face size, I’d also like to get your desired print run-- would 35 or so be adequate? Let me know what number you had in mind. Am attempting to reschedule to go back out to the shop on November 3rd, and will be setting type first and foremost, hence why the desire to get type face style and size settled. On a slightly separate note, I'm including some interesting information on Bodoni as a type face – a type face that I have really fallen in love with. “Bodoni has an increased stroke contrast and a more vertical, slightly condensed, upper case, but has been taken to a more extreme conclusion. This particular type face has a narrow, underlying structure with flat, unbracketed serifs, extreme contrast between thick and thin strokes, and an overall geometric construction. The original type face developed out of preceding anatomical changes to the letterform during the sixteenth through the eighteenth centuries. These changes increased contrast between the form and counterform, vertically aligned the axis, increased contrast in line width, and increased sharpness of serifs. The letters were to be designed based on scientific principles of the 18th c, and be constructed through the use of a grid and calculated curves. I loved reading about the history of the anatomy of the Bodoni type face -- what a gorgeous description of the way it deals with "light and shade"-- stunning. I'm in support of the 10 pt font size. What you're saying about finding paper that shows slow gradation/movement of color is fantastic also. Glad that you like my ideas about compression, smaller paper size, smaller margins, and the two-sided layout. In terms of the print run -- I am really not sure. I'd like to be able to circulate a few -- maybe 10 or so? The rest is up to you entirely. I think we're very much on the same page with this. Let me know what starts to emerge when you go to the shop on the 5th. I posted on Zumbar the first session I had with setting/selecting type for your translations as part of my printer-poet/poet-printer ongoing conversation with the work that I slowly interact with as it develops into a printed object. You'll notice that I'm recording my interaction with your work in real time. That's how I'd these "sessions" to emerge on the site; I want them to somewhat roll off the press to give readers a sense of what happens at a print shop while working on a single project, even if the amount of work done on that project is minimal -- all must be included and recorded -- with some imaginings at play, naturally. Look for the next one of these sessions on Zumbar soon. I finished your broadside this past Sunday and am so pleased with the inking and color mixture and how that mixture illuminates and also dims the language. As you know, the print run is very small -- 8 copies on the original black stock, plus another 3 on a type of black stock that's a bit thicker but has a white backside, making for 12 copies in total. Let me know where I should send your copy and if you would like more than one. Forthcoming, combined notes on a previous session, along with this last one will be posted on Zumbar this weekend along with a scan of the broadside and a proper announcement. zumbar press © 2011. Powered by Blogger.